Traveling to the 1920’s, an era that is notable for the multitude of social changes, and several upheavals in the political realm with the conclusion of World War I and the realignment of several monarchies throughout Europe. Thus, the incursion of Russian émigrés, titled and not, into England after the fall of the final Romanov Tsar. Here we find Alecia, newly arrived to London as a career woman and personal secretary to the owners of The Grand Russe Hotel. She’s a diligent, rather innocent and reserved young woman, certain of her own skills if a bit unsure socially. The glamour and glitz of the hotel, the newness of Jazz and the apparent free-for-all socialization of the young people and her own curiosity and desire to make her own stamp on the world are all in play. Ivan works at the hotel: far more worldly and free, he’s decided to explore Alecia further. He’s dashing, daring and different, and Alecia’s limited experience is wowed by his manner. But there’s also far more to this Russian émigré, things that Alecia may not be prepared to deal with. Characters were well drawn, although I wanted to see more of the dichotomy between good and evil, secrets and openness that Heistand used here. She’s capable of it from earlier titles I’ve read in her Redcakes series, so I did feel more could have been brought to both characters. 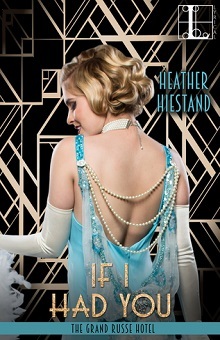 Settings, the feel of the 20’s and even the bits of intrigue were well done, but without that real OOMPH from the characters to draw me in and have a stronger emotional reaction to them, the story was light and interesting for the most part, but nothing compelled me to keep on reading as I had to turn the next page. A little meandering in spots did make this story a bit uneven in terms of pacing, but an interesting first installment to a series, one that leads me to hope for more challenge in the characterization in future books.